OK. You asked for it. 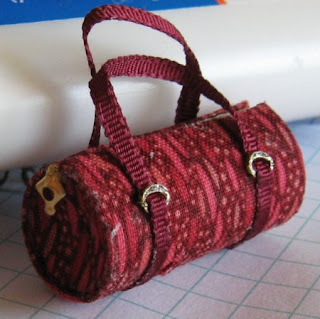 For now I am just going to give you the simplest bag to make. This is a barrel bag or duffel, depending on what size you make it. I am doing one made from the outside of a size small Tampax tube. You need Tampax brand regular, not any of the fancy ones. They are the ones that have cardboard tubes. Maybe I should start with a list of supplies. Tools: small sharp scissors, white glue(I use Elmer's white in a needle nose bottle) , and exacto knife to cut the tube. It is helpful to have a needle nosed glue bottle if you have one. lined index card. Also 1/4" graph paper for measuring if desired. 1. I generally buy one of the Tampax boxes that has 3 sizes in one. That will give you a LOT of different sized bags. 2. A 6"square piece of natural fabric. Use cotton, silk or linen. Polyester and polyester blends just give you a headache. They don't glue well at all. 3. A 7" long piece of ribbon or trim. This is for the handle and can be longer if you want a shoulder type bag. 4. A piece of metallic trim for the zipper. It should be a little longer than the purse. You will have to put glue on the ends and cut through to keep it from fraying. 5. Four metal rings. The ones in the photo are from an old necklace that I tore apart. 6. One piece of a finding for the zipper pull if you want one. The first thing you do is either with a piece of graph paper (1/4" squares) or a lined index card(they are lined in 1/4"), make a mark on the tube 1 1/4" from the end all the way around. 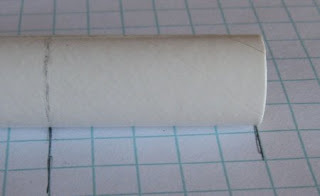 I find it easiest to use the graph paper because you can cut a strip 1 1/4" wide, wrap it around the tube and mark it. Next you cut a piece of the index card that is the same width. In this case,it's 1 1/4" wide. Then cut it to exactly fit around the tube. Then you cut a and glue a piece of fabric to the outside. Miter the corners. Fold to the inside and glue. Cut two circles of fabric about 1/8" bigger than the end of the tube. Run a fine line of glue around the very edge of the tube and stick one circle to each end. Let them dry a little and then cut little "V"s in the fabric all around the edge of the circles. 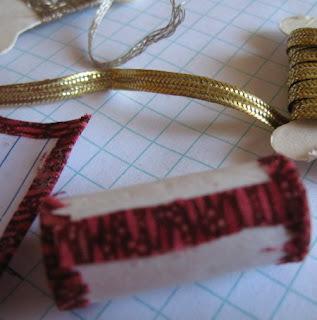 Glue down the clipped part of the circles to the body of the bag. It should look like this. Now take a scrap of fabric about 1/4"wide and not quite as long as the purse and glue it where you want to put the zipper. This is in case the zipper doesn't cover the gap when you wrap the outside around the bag. You can find different metallic trims that work for zippers. There are a couple in the photo. The silver I found at a mini show. The gold is from a plain old fabric store. If you have trouble finding something, take a close look at wider trims. Sometimes they can be cut apart to make them work. Put some glue on one end of the trim and also in from the end about the length of the purse. Most of the braided trims will unravel unless you do this. 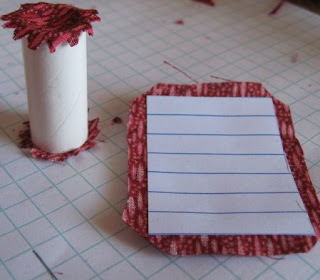 Now put glue on the inside of the covered index card piece and wrap it around starting by one edge of the zipper. Like magic, the thickness of the fabric will make a gap in the edge just about perfect for the zipper. Poke pins in the edge and let it dry. Next we come to the handle. Starting at the center bottom, 1/4" in from the edge, run a thin line of glue up the side of the purse and glue one end of the handle on that line, sliding a ring down to sit about 1/4" from the zipper. Now take the opposite end of the handle piece and do the same on the opposite side of the same end. Make sure that it's not twisted. You should have handle and rings both glued on one end and the middle of the handle loose. Run a line of glue on the other end to match the first one. Take the middle and center it on the bottom of the other end. Pull the handle up, gluing the rings level with the ones on the other edge. 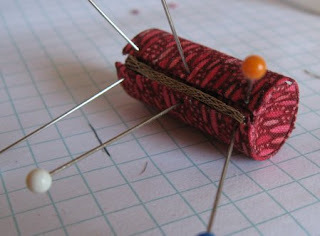 Glue your piece of finding to one end to represent the zipper pull if you would like one. Happy purse making! Have fun! What can I say but excellent? It looks just like a grown up bag in the picture. You're such a clever girl, Casey. Modest too!